TOKYO — Touching down here for the first stop of his five-country tour of Asia, President Donald Trump said he expected to meet with Russian President Vladimir Putin during his trip. "I think it's expected we'll meet with Putin, yeah," Trump told reporters aboard Air Force One en route to Tokyo from Hawaii. "We want Putin's help on North Korea, and we’ll be meeting with a lot of different leaders." The face to face, which would be Trump's third with the Russian leader, will likely come in Vietnam later this week at the Asia-Pacific Economic Cooperation (APEC) Summit, amid heightening global tensions around the North Korea crisis. Asked if he thought North Korean leader Kim Jong Un might test another missile during Trump's time in the region, the president said "we'll soon find out. Good luck!" But the expected meeting with Putin also comes at a time of continued American scrutiny, both of alleged Russian meddling in the 2016 election and investigations into whether there was any collusion with anyone involved in the Trump campaign. Less than a week before Trump departed on the trip, former campaign chairman Paul Manafort and his deputy Rick Gates were indicted by Special Counsel Bob Mueller and it was revealed that former campaign adviser George Papadopoulos had pleaded guilty to lying to the FBI about contacts with Kremlin-connected Russians. Related: Trump’s Foreign Policy Is Pure Trump. And It’s Working For Him. 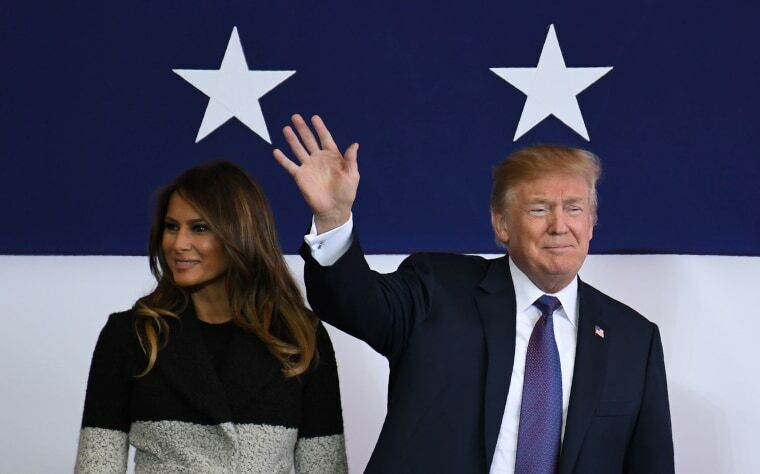 Upon deplaning in Tokyo, Trump, joined by first lady Melania Trump and seeming to be in good spirits, addressed troops at Yokota Air Base. He signed photos and even dollar bills as he walked in. "Japan is a treasured partner and crucial ally of the United States, and today we thank them for welcoming us and for decades of wonderful friendship between our two nations," Trump said. Mixing promises of military might with flourishes of his off-the-cuff stump style, Trump rallied the troops to cheers. He boasted of the “beautiful, brand new equipment” on its way, telling the soldiers to "use it well." Praising American service members, Trump told the troops: "We dominate the sky. We dominate the sea. We dominate the land and space." And Trump issued a warning to those dictators and regimes that might underestimate American resolve, reminding that for those who have in the past "it was not pleasant for them." But the president also showed his softer side. As he took the stage, the commander-in-chief was presented with a bomber jacket. "Should I put it on?" he polled the crowd with a smile. "I like this better," he said, shedding his own suit coat and donning the bomber instead.